Here is a fine example of what thumb-sucking can do to teeth! Megan had sucked her thumb throughout childhood and even into her adult life. As you can see, only her very back molars contacted each other when she bit down. This type of open-bite situation almost always requires jaw surgery to correct. For Megan, jaw surgery wasn’t a realistic option so we approached her treatment differently. 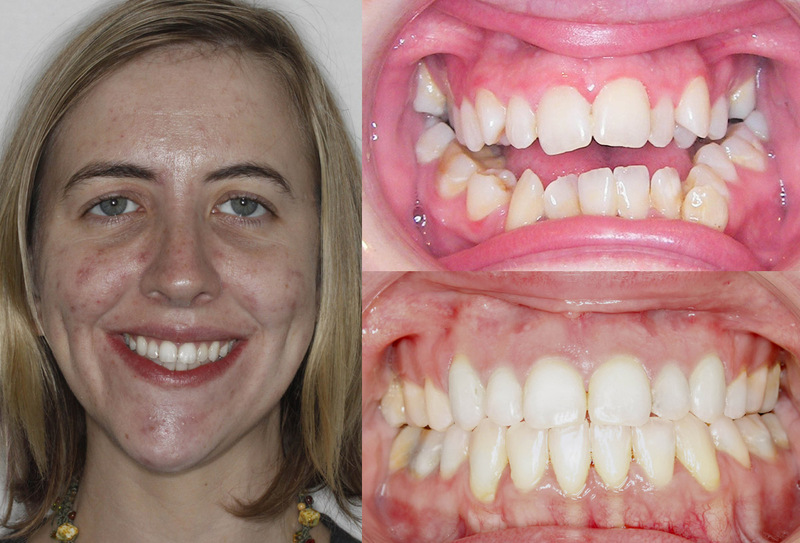 Of course braces were required on all of the teeth but we also used temporary mini-implants. These mini-implants were placed in her palate and lower jaw and used to move upper molars back up and lower molars down as these teeth had over-erupted due to her thumb-sucking habit. Until recent years, only jaw surgery could impact or move teeth back where they had erupted from. Now, we regularly use mini-implants as anchorage to perform tooth movements that weren’t possible before.